Gender inequality in the film industry has been a hot topic for a good while now, but especially in recent weeks. Over the past nine months, Stephen Follows researched gender inequality in the UK Film Industry. Stephen is an award-winning writer and producer, so we can feel assured he knows exactly what he’s talking about. Check out his full report HERE, plus the many projects he’s been involved in, HERE.You can follow him on Twitter as @StephenFollows (and you should!). I read Stephen’s whopping 140 page report, not to mention a stack of other articles and discussion. Stephen himself also kindly offered some quotes for this article. So here’s what I took from it all and want to share with you – ready?? Let’s get one thing straight before we start. The UK Film Industry IS predominantly a man’s world. 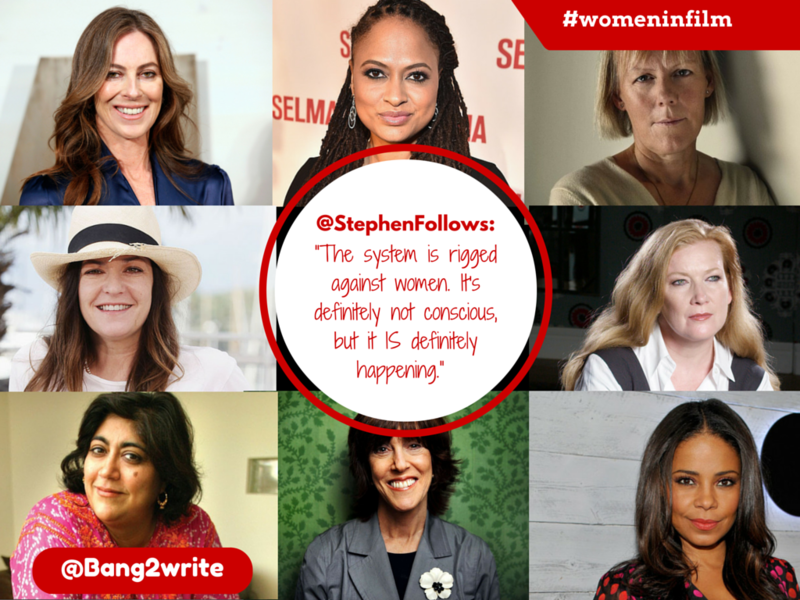 Stephen’s research shows that after their first feature, women will direct fewer films than their male peers. Stephen also found the higher the budget meant less chance of a female being hired. 2,591 films were released from 2005 – 2014, 13.6% were directed by women. In 2005, 11.3% were directed by women. In 2014, 11.9% were directed by women. So let’s shut down the idea that female filmmakers and their opportunities are diminishing because of our desire to ‘play house’ and ‘raise a family’. It’s an unfair and inaccurate generalisation that proposes stereotypical ideas. One thing is clear: there are simply not enough opportunities available to women. Our full potential can only be reached by competing on a level playing field. Also worth remembering: we also need to value the support of our male allies. Both genders need to consider each other as we navigate this business together. 2) Congratulations, You Got The Job! In an ideal world, career opportunities would be offered based solely on skills and abilities. But Stephen’s research found that career prospects and roles for women in the UK Film Industry are severely limited compared to their male companions. The more senior a role in the industry, the less likely it is held by a woman. In all but two key departments, female representation ranged between 6% – 31%. The majority were found in Casting/Make-up/Costume. A total of 17 crew credits were studied – 14 out of the 17 had fewer females than males. The best candidate for any job relies on experience, but if more experience is offered towards men, than that is an unfair advantage in any profession. 3) We’re All In This Together … Or Are We? Wow, that’s a BIG decline. Yet it’s our duty as filmmakers to showcase a varied and inclusive representation of the public, especially as public funds support these films. These percentages sadly do not provide a true representation. 4) Do Film Students /Industry Entrants Stand A Chance? Only 27.2% of British Short Film directors are female. Only 14% of TV Drama directors are female. 1% of low-budget films directed by females. Even if we are to assume that 27.4% of female short film directors is a “true” representation of the talent pool (Newsflash: it’s not), it still simply does not make sense that MOST of these talented females “don’t want to” make TV Drama, features or high budget films after making shorts! C’mon. There ARE enough women and our ideas to level the playing field. Now is the time to change the situation for ourselves and for others following in our footsteps. To summarise, the cause is believed to be down to those hiring and their preferences. For example, research found that female creatives had a higher percentage of women in their departments. The responsibility of changing the current situation falls on all of our shoulders. We must value each other and strive to create an environment where talent and imagination creates endless possibilities for both genders. Stephen Follow’s research found that men *do* have a significant advantage in UK Film in comparison to women. But it should be noted he also concluded there was NO EVIDENCE found of any organised or conscious and deliberate effort to exclude women in the industry. It is believed these decisions are made due to an unconscious bias. But overall, there’s nothing to debate anymore: this IS happening but we can use the figures to our advantage. In order to stop any type of discrimination we must support each other, ignoring every sub-category or label. These facts are our fuel to create more opportunities and a better circumstance for ALL writers. So what are we waiting for?? Let’s GO!